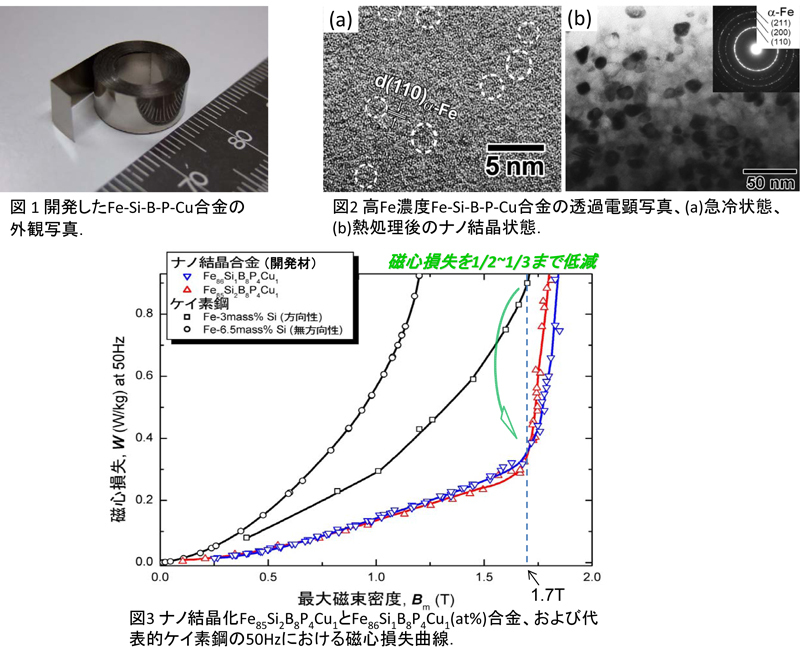 The research group of Professor Makino at Advanced Research Center of Metallic glasses has developed a new nano-crystalline soft magnetic material composed of ~95 mass% Fe without rare-earth metals. The new low-cost soft magnetic material exhibits high magnetic flux density (1.8~1.9T) along with extremely low core-losses (1/2~1/3 of the ordinary materials). The group is also collaborating with various companies for its practical applications in transformer cores, electric motors, choke coils etc.. Currently, electrical power loss resulting from the magnetic core-losses in motors and transformers is estimated to be 3.4% of the total domestic electrical power consumption, that accounts for more than 2% of total CO2 emissions. High magnetic flux density silicon steel is the most widely used core material over 100 years, and further reduction in core-loss seems to be impossible. In view of increasing demands of high efficiency and high performance electric motors for hybrid/electrical-vehicles (HEV/EV), the development of new low core-loss materials is extremely important. The new nano-material developed in Professor Makino's group is expected to not only contribute in reduction of CO2 emission but also be useful from the perspective of conserving the Earth's resources. The research achievements are scheduled as an invited talk at the 55th Annual Conf. on Magnetism and Magnetic Materials which will be held in Atlanta, USA from 14~18 November. The related articles have already appeared 7 time in newspapers; Nikkei, Nikkan Kogyo (twice), Nikkei Sangyo (twice), Chemical Industry Sinbun and kahoku shimpo from 20 May to 28 July.